Please select options for Xtreme Stop Precision Drilled & Slotted Rotor w/ Ceramic Brake Pad Kit - Front (05-10 GT) at the top of this page. 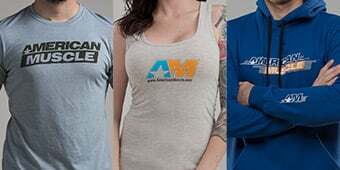 Hey guys, Adam here with americanmuscle.com. Today I'm bringing you a detailed overview and installation of the Xtreme Stop Precision Drilled & Slotted Rotors along with the Ceramic Pads for the front of all 2005 and 2010 Mustang GTs. The installation will be a very simple brake job. Swapping out the rotors and the pads. So, overall, it will get a one out of three wrenches on our difficulty meter. The Xtreme Stop Precision Drilled & Slotted Rotors, along with the Ceramic Brake Pads in the kit will be for the front of any '05 to '10 Mustang GT that needs an improvement in braking performance and the initial bite. Now this is, obviously, gonna be a huge upgrade over the factory option since it does go from a solid rotor to a drilled and slotted option with, of course, an upgrade in padded quality going from the standard option to these ceramic pads from Xtreme Stop, so this is definitely gearing for the guys looking to put the bite back in their braking performance. Especially if they're already worn down enough to where they obviously need replacing. This one's gonna be a relatively affordable option compared to some of the other ones out there and definitely comes with pads that reduce noise and, of course, less brake dust. Always a plus. Now, the first thing I wanna start on is this drilled design you see here. Now, there's three designs, four designs, and they kinda repeat all the way around the rotor. Now that is actually to dissipate the excess heat that your pads will be causing when in contact with the rotor on the street or on the strip which cause them to lose some of that initial bite. So, this'll actually form a vent, so to speak, which helps the heat dissipate through the rotor design, through the vented vane in the middle and allows the excess heat to escape giving you that initial bite back. In addition to all that, it also helps in wet weather conditions because the rain'll slip right through the drilled holes in the rotor giving you a better contact as well. So, overall, there's a couple of different purposes for those. The next part of the design is, obviously, going to be the slots in here which are kind of just indented grooves going on an angle. Now that is actually gonna help with brake dust that can build up on the surface of the rotor. As you continue to use your pads, your pads will create this brake dust which can sit on the surface of some of those solid style rotors, but with this indented groove, it helps that dust to slip off and away from the surface giving you a better initial bite. Less stuff on the surface, less stuff preventing your pad from biting down on the rotor surface.In addition to the drilled and slotted design on top, there's also a vented vane design which you can see here on the inside of the rotor. That actually helps when the gasses and heats escape through the drilled design. They end up inside the rotor, in which case the vented vane allows them to escape a lot easier. So together with those two combinations, the drilled and the vented vane on the inside, it definitely improves all around your bite and escapes all that heat and extra gasses. As far as materials and construction goes, this particular rotor was CNC machined out of a premium cast iron with, of course, a one piece design and it shows off the drilled holes and the milled slots for a balance. And before we leave the topic of the rotors and the heat dissipation, this particular option from Xtreme Stop can reduce operating temperatures up to 200 degrees when compared to the OEM option. 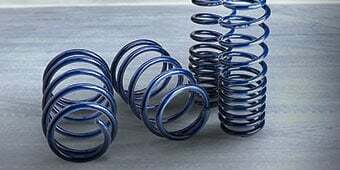 They are then completed in a bright zinc electroplating treatment which gives them that bright textured finish, and on top of that helps with corrosion and rust resistance. The pads themselves are made of a ceramic material with a carbon graphite core which, of course, is a longer-lasting pad than the factory option, which gives you less brake dust and gives you a quiet, noise-free ride. On top of that, the factory pads are rated for about 50,000 miles worth of life. Now, obviously, this all depends on how you drive. If you're beating on your brakes constantly, numbers are gonna be different. But, on average, factory brake pads 50,000 miles. When using these you can see somewhere from 60,000 and even more but, of course, like I said it all comes down to how you drive. When you're shopping online you'll notice there are options for Xtreme Stop, Power Stop, and Hawk among other ones around the aftermarket world. 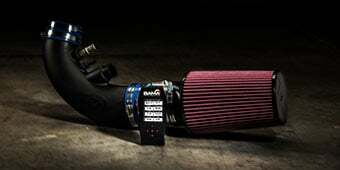 Now this one falls right in the middle of the pack, around $300 for the front end of your Mustang. 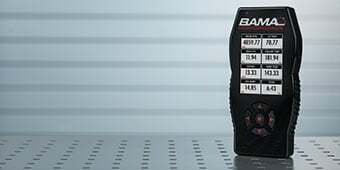 Now this, of course, is gonna come down to how much you wanna spend, what exactly you're looking for in a rotor design, and if you're brand specific. As far as installation is concerned, obviously, a brake job is a brake job no matter how you cut it. So, this one is definitely gonna be a very simple job with a one out of three wrenches on our difficulty meter. Now with these, a ratchet socket set should do the trick. Have a jack and jack stand or a lift if you have access to one it make your life a whole lot easier. But, of course, a jack and jack stand will do the trick. When it comes right down to it, you'll have to get the car in the air and one of the front wheels off to gain access to the braking system. From here you will have to remove your caliper which is just a couple of bolts. And, of course, you want to hang it up using a coat hanger or something so you don't put too much stress on the brake lines. Once you have that taken care of pull your factory rotor off, which might take a mallet if it's rusted on there. So, pop those bad boys off, pop on the drilled and slotted option from Xtreme Stop and then you can bolt back on your caliper. Once you have that caliper off, you want to make sure you swap out the factory pads with the Xtreme Stop pads and use the brake grease that's actually provided for you in the kit. Makes your life a whole lot easier. Once you have all that together, snap everything back into place, put the wheel back on, drop the car on the floor, repeat the process for the opposite side. Overall, you're looking about, I'd say, an hour or so on the installation. 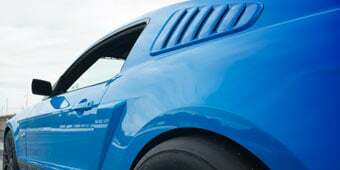 I'd give it a one out of three wrenches on our difficulty meter.Just to wrap things up, if you're the owner of an '05 to '10 Mustang GT, you might be looking for a way to swap out your factory braking system for a new set of rotors and pads with an overall drilled and slotted design that give you a better braking performance and initial bite while getting some new pads that can reduce brake dust and noise as well, increasing your braking performance all together. 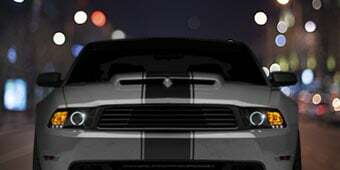 If that sounds like something you're interested in the Xtreme Stop Precision Drilled & Slotted Rotors and the Ceramic Pads for the front of your vehicle are available right here at americanmuscle.com. More Braking Power. Give your 2005 to 2010 GT Mustang more braking power by upgrading your front brakes with this Xtreme Stop Precision Drilled and Slotted Front Rotor with Ceramic Brake Pad Kit. The rotors are drilled and slotted to reduce the amount of heat generated during hard braking by approximately 30% and are perfect for the street, track, or drag strip. 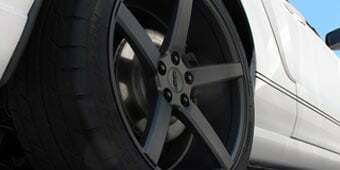 You will see a 15% increase in braking power when compared to your OEM rotors and pads. Superior Rotor Construction. XtremeStop CNC machines their one-piece Brake Rotors from premium cast iron with drilled holes and milled slots to maintain a perfect balance. XtremeStop's precision hole and slot design provides a reduction in operation temperatures up to 200 degrees when compared to standard OE rotors. XtremeStop then completes their Precision Rotors in a bright zinc electroplating treatment to provide good looks and protection against rust. Cooling Vane Design. Unlike other brake rotors that are a solid design, XtremeStop’s Precision Rotors feature a vented vane design with an internal chamber structure. These vanes allow the hot gasses to escape easier to further enhance the cooling performance of your brakes. 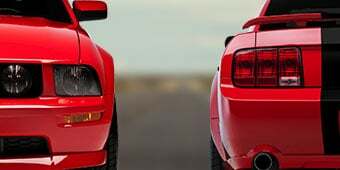 Quicker heat dissipation in turn increases your Mustang's braking performance. 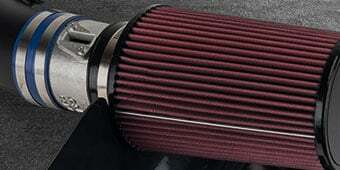 Carbon Ceramic Compound. The included XtremeStop Brake Pads are engineered and manufactured in North America. These Brake Pads are made from a carbon ceramic compound using a positive mold manufacturing process for consistent quality. Using 10 times less resin content than low cost and OEM pads, XtremeStop Pads are post cured (heat treated) to ensure superior density for better braking performance and longer pad life. XtremeStop's Ceramic Brake Pads will last up to 35,000 miles under normal driving conditions. Minimal Dust and Noise. Seeing that the included XtremeStop Brake Pads feature a slotted design similar to OE pads and a unique rotor friendly carbon ceramic compound they will produce significantly less dust than the original factory pads. Quieter than stock, XtremeStop Brake Pads utilize rubber coated shims to help minimize braking noise for almost silent operation. Direct Fit Replacement Upgrade. 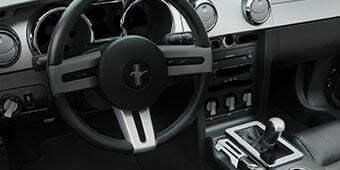 Xtreme Stop designed their Precision Cross-Drilled & Slotted Rotor and Ceramic Brake Pad Combo Kit to be a direct fit replacement upgrade for your Mustang's stock rotors and pads. Installation can normally be completed in under three hours with just basic hand tools using the existing calipers and hardware. Complete Front Kit. This Xtreme Stop Precision Rotor and Ceramic Brake Pad Kit comes complete and includes (2) 12.44" Front Rotors as well as a set of Front Brake Pads. The Kit also includes all the required hardware needed for installation on your Mustangs original factory calipers. Application. This Xtreme Stop Precision Cross-Drilled and Slotted Rotor Kit with Ceramic Brake Pad Front Combo Kit is specifically designed to fit the front of 2005-2010 GT and Bullitt Mustang models. Great buy! Looks great and perform great. Recommend for anyone needing breaks and rotors. I picked these because I like the way the vents are cut short, looks mean!